One of the world’s most common and nutritious food sources has been ignored for decades in the United States and many other prominent countries. This source of sustenance has even been considered taboo in those nations, despite being a common part of the average diet in 80% of the world’s population. It’s bugs. Yes, we mean it. Edible insects have been a part of human diets for centuries, and for most of the world they never left the table. Given the incredible nutritional value packed into the most commonly eaten insects, it’s kind of surprising that eating bugs hasn’t been the centerpiece of a hit fad diet already. 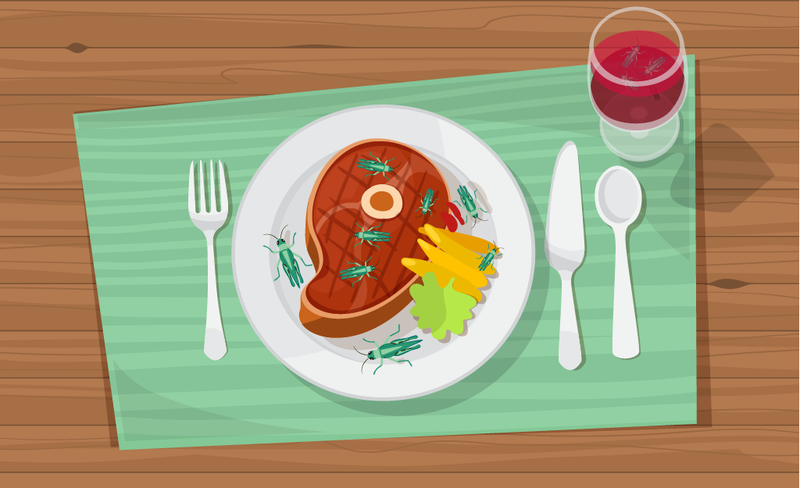 To illustrate the tremendous dietary potential of edible bugs, we decided to take a close look at the nutritional facts of some commonly consumed insects to see how they stack up against some other foods that are are regulars on the dinner plate. Crickets are among the most commonly eaten insects on earth, and they are surprisingly versatile. Whether pan-fried and seasoned to serve as an appetizer at Mexican restaurants or a snack at Major League Baseball games, or ground up into flour and baked into cookies, crickets are everywhere when it comes to food. It’s honestly no surprise given how versatile and nutritious the insect is. Crickets are rich in a number of vital elements the body human body needs, packing a major nutritional punch into their little bodies. 100 grams of cricket contains more calcium than the same amount of milk, more fiber than 100 grams of green beans, and more than three times the iron present in a comparable amount of Popeye’s favorite food, spinach. A cricket a day may not keep the doctor away, but it sure it an efficient way to get some vitamins! Speaking of calcium disparities, we were stunned to find out how much better bugs are when it comes to providing that particular part of a healthy diet than something like pork. While we thought insects might contain more calcium than the other white meat, we didn’t expect them to contain SO MUCH more. 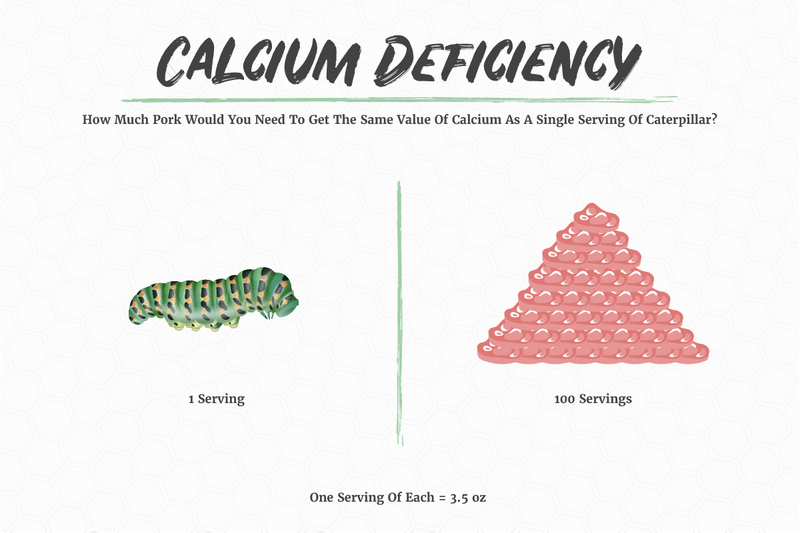 To get the same amount of calcium present in a single 3.5 ounce serving of mopane caterpillar someone would have to eat a literal pork mountain consisting of 100 servings of the same amount of pork. Yes, ONE. HUNDRED. Hope you’re hungry. From burgers to steaks, people are crazy for cows, so of course it makes sense to see how insects stack up to cows. 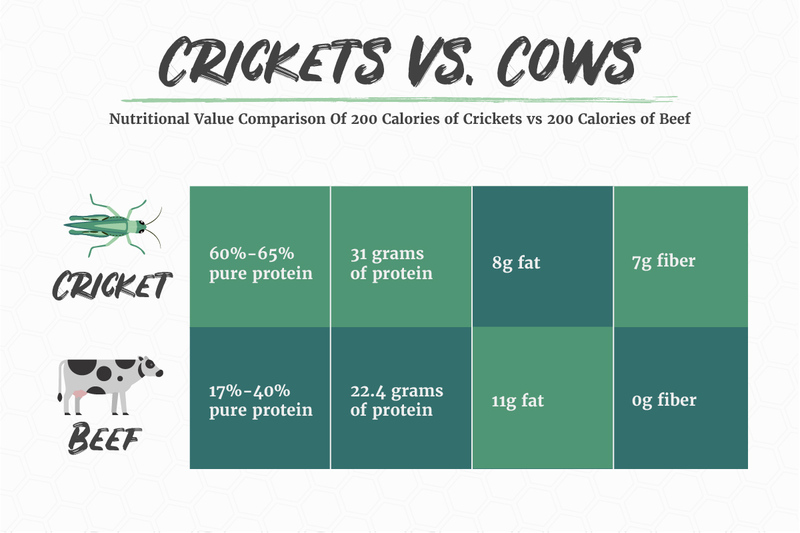 Comparing 200 calories of beef to the same amount of crickets unearths a number of areas where the bug is better than the beef. 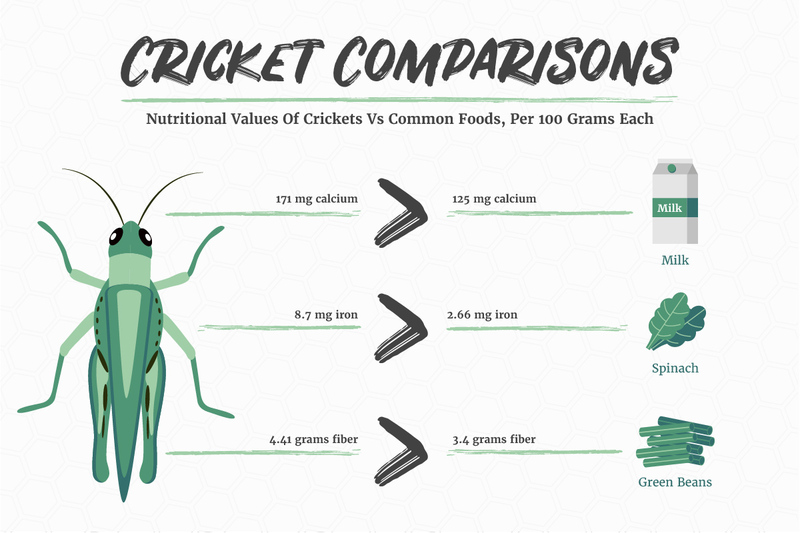 Crickets contain a higher percentage of pure protein, more grams of protein, less fat, and more fiber. Cricket burgers at the next cookout anyone? 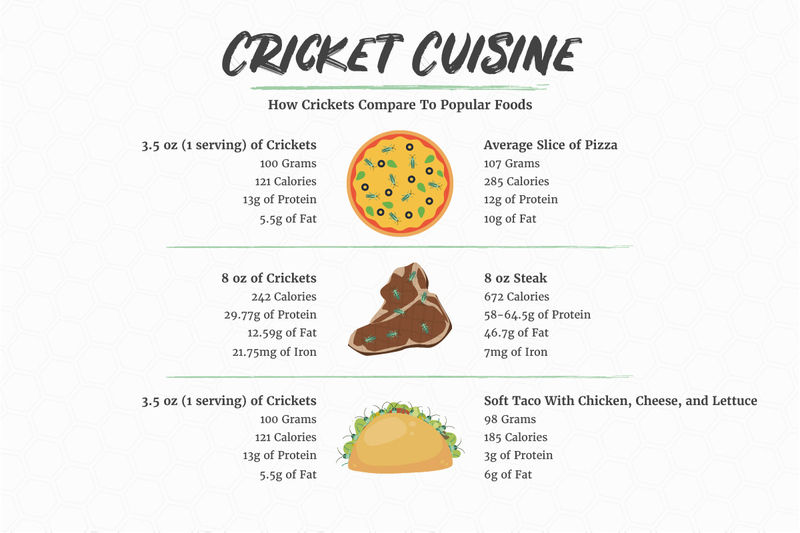 Crickets are more nutritious than any number of popular foods, from pizza to steak to chicken tacos. Comparable serving sizes of crickets have fewer calories and less fat than all of those dishes. And while steak may best them when it comes to total grams of protein, crickets have the superior iron count, all while managing to top pizza and tacos when it comes to protein content. So how about bugs other than crickets, how to they compare? Surprisingly well, as the chart above illustrates. Earthworms, mealworms, house flies, and, of course, crickets win and lose some nutritional value battles when compared to chicken, ground beef, and salmon. 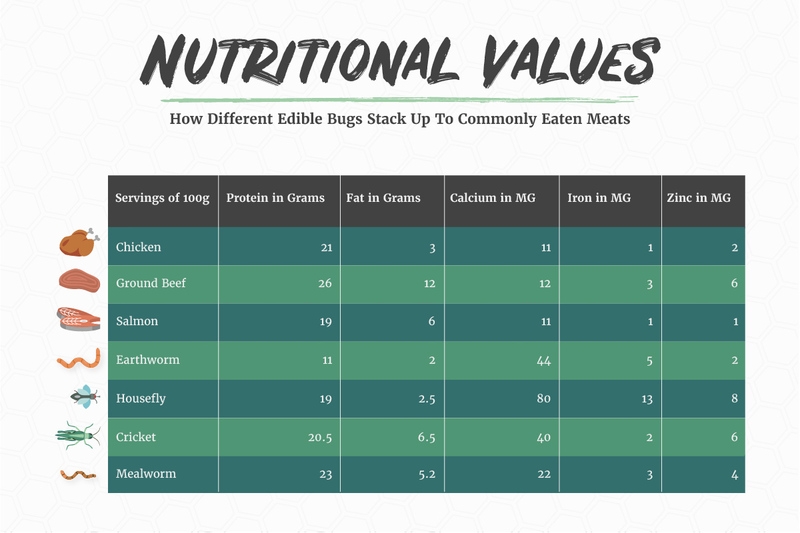 It is worth perusing the whole chart, but pay attention to the columns for iron, zinc, and especially calcium, where all of the different bugs stack up quite well with the more traditional meats. 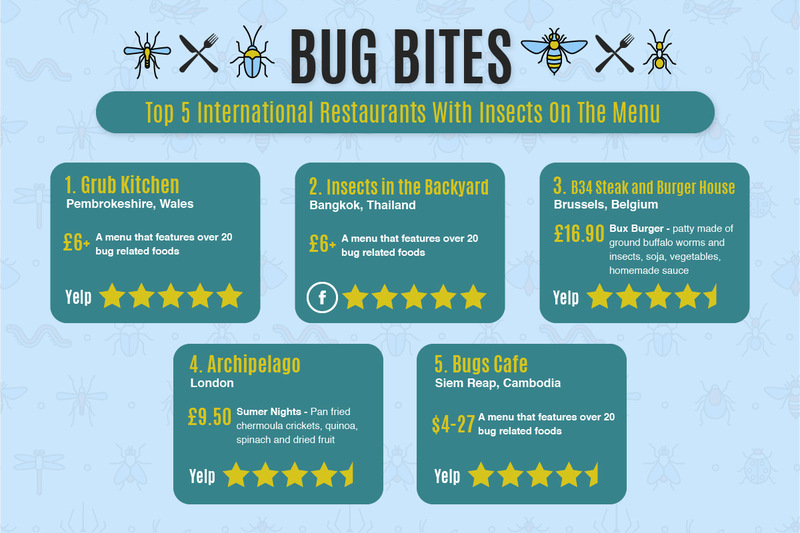 For any readers interested in a buggy meal but worried about preparing insects incorrectly at home, there are a number of restaurants around the world that have begun serving bug-based dishes. 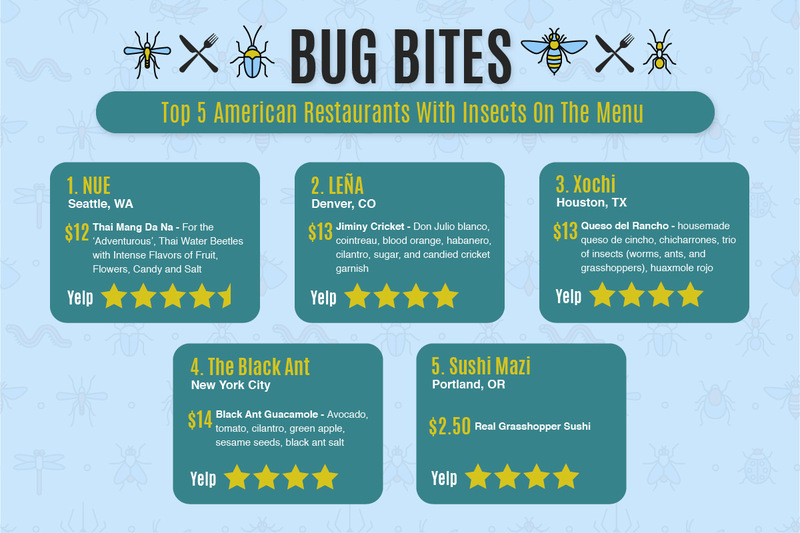 To help those daring diners seeking out insect ingestibles, we found some of the most highly-reviewed restaurants with insect dishes and compiled their information here in one convenient place. International eaters can find options located throughout Europe and Asia above, while American diners can choose from a diverse collection of establishment throughout the country below. We hope this research has given you a new outlook on edible bugs, and for those bold few out there willing to give grasshopper gourmet or chomping on crickets a try, Insight Pest wishes you good luck and “hoppy” eating!